« Origin of a Dish: What Was So Great About Sliced Bread Anyway? Note the Schrafft’s bag in her hands. In anticipation of the premiere of Mad Men on Sunday, I’ve been re-watching the series from the beginning. Mad Men is full of delightful details of day-to-day life in the 1960s. 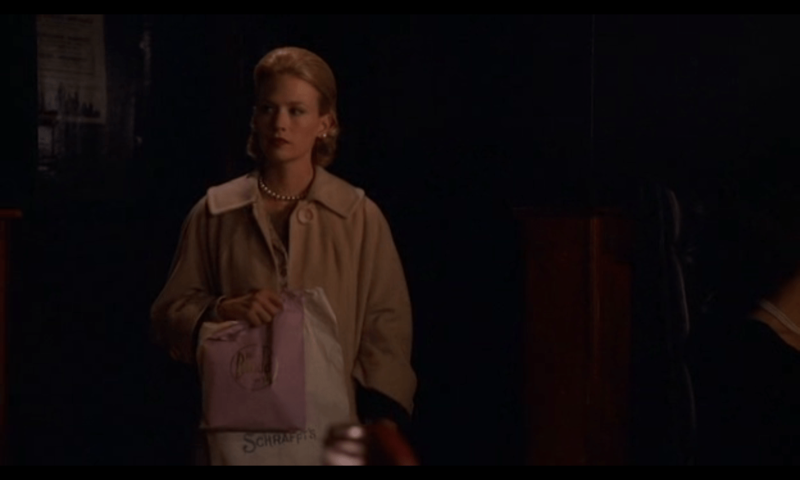 One of these period touches caught my eye in the season two finale: Betty Draper clutched a bag from Schrafft’s. Schrafft’s was probably the most popular chain restaurant in mid-20th century New York. Geared towards women, it offered a space where it was considered appropriate and acceptable for ladies to dine together without the company of men. It offered luscious desserts and boxes of chocolates (I bet Betty’s got some sweets in her bag), as well as waist-conscious salads and practical sandwiches. Digression: For a deeper level of food nerdery, I noticed that one of the production managers for the show is named Dwayne Shattuck. Frank Shattuck was the founder of Schrafft’s. It’s not a common name, so I wonder if they’re related, and the careful placement of that Scrafft’s bag was a nod to Dwayne’s heritage? Dwayne, if you’re out there, tell me if I’m right! If you’re planning on serving a little gnosh at your Madmen watching party, why not serve some treats from Schrafft’s? There is a great recipe book called When Everybody Ate at Schrafft’s. It’s chocked full of tasty dishes from the iconic restaurant. But the best Schrafft’s recipe I know is for their famous Cheese Bread, which was originally served stacked with slices of grilled ham. I’m not a bread expert, but I’ve had great luck with the recipe and it is well worth making. It’s warm, satisfyingly cheesey, and great in sandwiches or simply slathered in butter. Get the cheese bread recipe here. If you’d like to make a few more items from Schrafft’s, there are vintage menus available here, and here is a recipe for their butterscotch cookies. Need a side-dish for your Mad Men feast? How about Jell-O Vegetable Trio, a “…dazzling, delicious rainbow of fresh vegetables at you dinner table,” from 1962. And for dessert, try a classic Baked Alaska. Any ideas for your own 1960s Mad Men dinner? What a GREAT post Sarah! I’ve never seen the show Mad Men (I don’t watch much TV much:) but I do know it focuses on the 60s. The first thing that pops into my head is Julia Child. Didn’t the French Chef premier in the 60s? I’m so glad I popped in. I must add your blog to my side bar so I drop by more often. Yes! And Don’s favorite drink is an old fashioned (with the fruit in the bottom.). Betty seems to like gimlets. Love the post and the idea! But I must correct a piece of history…Frank Shattuck developed the Schrafft’s restaurant chain with the support of the sons the company’s founder, George Schrafft. At the heart of every restaurant was a Schrafft’s Candy store, housing their collectable Chocolate Boxes filled with scrumptious treats. Unfortunately the book you noted neglects this key to the success of Schrafft’s. Mad Men buffs can still visit the landmark Schrafft’s Candy Factory in the Charlestown section of Boston today. It’s true…how I understand it is Shattuck was a traveling salesman for Schrafft’s candy. He then had the idea to build it into a chain restaurant. And I think I will visit the candy store the next time I am in boston!